If you’re missing teeth, or if you’re tired of your dentures not fitting right or causing sores in your mouth, All-on-4 is a revolutionary dental procedure that was developed by Nobel Biocare to give you a choice. You can choose full or partial dentures which may not fit right or limit your ability to enjoy the foods you love, or you can choose All-on-4 performed by our Harleysville Dentistry dentists to restore your smile and give you a new set of functional teeth. What is All-on-4 and How Does it Work? Is All-on-4 Right for Me? One of the greatest things about All-on-4 implant dentistry is that it can be performed even if the patient has reduced bone volume in their jaw. 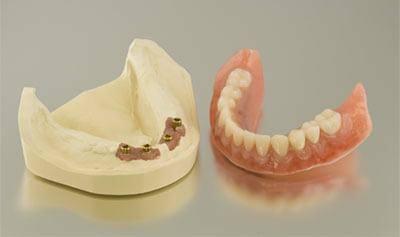 It’s typically less invasive than traditional dental implants and delivers great results with shorter treatment times. All-on-4 has been successfully used to restore smiles for more than a decade and our harleysvilledentistry dental practice has been performing All-on-4 in harleysvilledentistry for more than 5 years. If you’re interested in the All-on-4 treatment, we recommend requesting an appointment for a consultation with our harleysvilledentistry implant dentists. How Will I Benefit from All-on-4? How Can I Begin My All-on-4 Treatment? We recommend scheduling a consultation with our Harleysville Dentistry implant dentists if you’re considering All-on-4. We will need to assess your medical health and take some digital X-rays before we begin. If it’s determined that you’re a good candidate for the procedure, we will build a custom treatment plan that conveniently fits your schedule. Our offices are open past 5 p.m. Monday through Thursday and we are also open on Saturdays to better serve our Harleysville Dentistry dental patients. Questions? Ready to Schedule an All-on-4 Consultation in Harleysville Dentistry ? If you have questions about All-on-4, or if you are ready to begin your treatment, please contact us today to request an initial consultation with our Harleysville Dentistry implant dentists. We look forward to helping you restore your smile!